The service fee will include the Officiant services of up to 3 hours of the Officiant’s time. The Officiant’s time begins upon the Officiant’s arrival to the wedding location. The Officiant will arrive 30 minutes prior to the start time unless otherwise requested by the Client. * Includes Wedding License * Marriage Certificate - From Los Angeles County Delivered to you in approximately 6 weeks (county is slow) All Paperwork Handling - Filing Fees - Notary Stamps - No Hidden Charges * Basic Ceremony - Six Beautiful Styles - Customized to suit * Officiant Travel To and From the Ceremony * 3 hours of Photographer time * (1) High Resolution (CD) of Pictures * Mixed Seasonal Flowers Bouquet & Boutonniere Brides Maids flowers available at an additional charge. 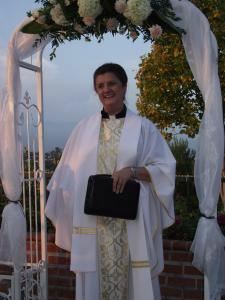 The service fee of $ 750.00 will include the Officiant and photographer services of up to 3 hours. The Officiant and photographer’s time begins upon the Officiant and photographer’s arrival to the wedding location. The Officiant will arrive 30 minutes prior to the start time identified unless otherwise requested by the Client. Beach permits of groups larger than 50 people are not included in this package but can be provided for an additional charge. Ceremonies to encompass all faiths to honor and celebrate your wedding day. Your ceremony should celebrate your traditions and rituals that have deep meaning for you. Rev. Rieley can customize the words that will express all those feelings you want to express for all of the following: Inter/Non-denominational Spiritual Interfaith/Interspiritual Civil/Personal Religious Intercultural/Interracial LGBT Some couples choose to create a service that is more spiritual than religious. Writing your own vows can be a daunting task and I can give you direction so you’ll be able to come up with something touching and heartfelt. Whatever your dreams and desires, I would love the opportunity to work with you and make sure that your wedding is an event to remember all your life.